As the years pass, men revisit the innocent totems of their childhood and find new and interesting ways to pervert them. Turning this trend into sweet swag: Moist Production. A ribald series of cartoon- and candy-based illustrations, MPs are the handiwork of an artist based in Brooklyn -- a borough not unlike the Disneyland of your youth, except the costumed animals refuse to let you sit on their laps. 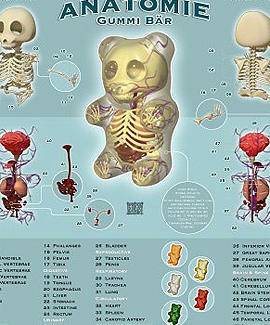 Poster-wise, MP hawks intricately detailed, 12x12 anatomical drawings covering subjects like vinyl rabbit figurines ("Visible Vinyl") and tweaked gummi bears, e.g., a sperm impregnating a gummi zygote titled "Immaculate Confection". Also for the taking: eyecatching graphic tees, like a ribs-backed ghost face w/ extended tongue called "Mirth Guts", and a comically ferocious Balloon Dog Skeleton that'd make for an excellent party trick at Tim Burton's 8th birthday. MP also offers a kaleidoscopic array of balloon-/gummi-themed desktop and iPhone wallpapers -- because the ultimate perversion of a childhood totem is to slap it on a device chaining you to 24hr labor.